Are you experiencing severe tooth sensitivity or toothaches in a specific area of your mouth? An advanced infection may be to blame. 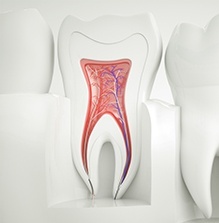 When harmful bacteria are able to penetrate the outer layers of the tooth and reach the vulnerable inner pulp and canals, extraction may seem like a foregone conclusion. Thankfully, this doesn’t have to be the case with the help of root canal therapy! Don’t wait –contact San Pedro Smiles today here in San Antonio, TX if you’re in need of complete relief. This procedure may seem scary at first, but patients will be relieved to discover that with the help of today’s modern techniques and tools, it’s actually very comfortable. 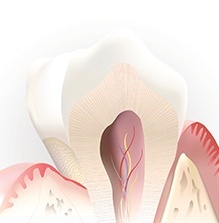 Dr. Gonzalez will start by accessing the inner chamber of the tooth and thoroughly removing all of the diseased pulp. After cleaning the tooth, he will replace the pulp with a safe, biocompatible substitute, and then seal the area once more as to minimize the chances of further infection. As a final touch, our team will design and place a custom dental crown over the tooth in order to fully rebuild its original shape and appearance. Root canal therapy has an overall success rate of over 90%, and many treated teeth go on to last for several more years without trouble.